EASY-CLEAN: Our candle making pitcher is smoothly lined for an easy clean up. 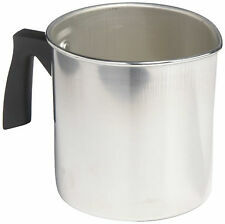 QUALITY WAX POURING POT: DIY Gateway's solid construction container is made from aluminium in the USA. Long-lasting pitcher will last for many years. 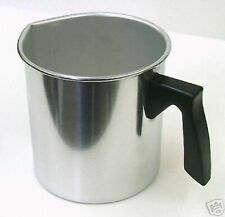 PRESTO POT WITH POURING SPOUT . This modified pot andSTAINLESS STEELSPIGOT will keep your wax flowing freely! 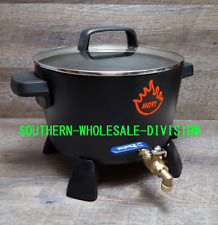 This pot hasnon-stick surface inside and out, so clean up is easy or, you can leave your wax right in the pot for your next use. 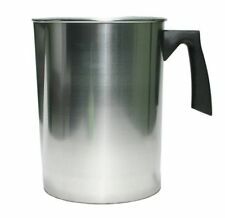 Our large aluminum pouring pitcher holds up to 4 lbs. The plastic handle stays cool even in a double boiler. The spout makes pouring even small candles a breeze. Holds up to 4 lbs. Aluminum construction. Has easy-to-pour spout and heat resistant plastic handle. Will not rust or corrode. Easier to use than "Coffee Cans". 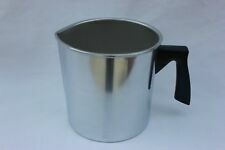 Made from aluminum with a pouring spout and black heat resistant handle. Heavy 12 gauge stainless steel crucible. Heavy 12 gauge mild steel shell and cover. Legs on tank raise valve height to your specification. Both pots are shown for size comparison only. They are new and never used. Has dents in the bottom but will not affect performance. The smaller size is great for pouring Votives. Made from seamless aluminum with a pouring spout and black plastic handle. IT WILL HOLD UP TO 80 OZ OF WAXOR ??. I TESTED IT. Candle Making Burner And Boiler. Condition is Used. Shipped with USPS Priority Mail. This is a approx. Unit (empty) heats to approx. 220 F in approx. 15 minutes (at 75 F ambient room temp.). High Temperature Silicon Rubber Wiper Blades. Pot is glazed inside and out. Material:stainless steel. We will reply you ASAP. Your kind understanding and patience will be highly appreciated. Yaley Enterprises Candle Crafting Candle Pouring Container. Manufacturer: Yaley Enterprises, Inc. it can also be used with soap. Candle Pouring Pot. Pour spout for easy pouring. With our dynamic pricing model, our prices are always competitive. Open Handle Fits over Most Pots as a Double Boiler. Seamless Construction Designed for Easy Cleanup. Size:Small Pouring Pitcher. Both pots are shown for size comparison only. They are new and never used.